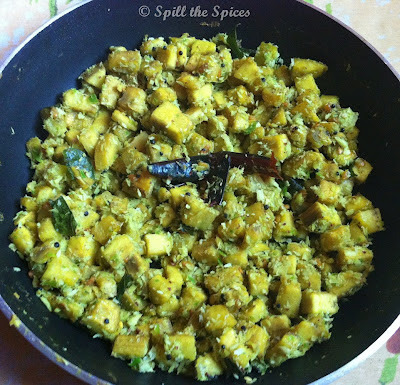 Raw banana (plantain) stir fry or vazhakkai poriyal is a simple stir fry with coconut. I have added garlic here but you can skip it and make a no-onion no-garlic stir-fry. This can be served as an accompaniment for rice and any South Indian curry like sambar, rasam and morukootan. 1. Crush the green chillies in a mortar and pestle or grind them coarsely in a mixer and keep aside. 2. Peel the skin of raw banana and chop into small cubes. Add 1/2 tsp turmeric powder, mix well and set aside for 2 minutes, then strain the water and wash well. 3. Heat oil and add mustard seeds. When it crackles, add urad dal and red chillies. When dal turns golden, add garlic and curry leaves and fry for few seconds. 4. Then add raw banana, turmeric powder, salt and mix well. Sprinkle some water, about 1/4 cup and mix. Cover and cook till it becomes soft, stirring occasionally. 5. Stir fry the raw banana in medium flame till all the water is evaporated and the banana becomes dry and lightly roasted. 6. Now add grated coconut, green chillies and stir well. Fry for 3-4 minutes. Using pestle and mortar is good way of cooking. Nice blog. Please remove the Teddy/give it a close button as it comes up in front of the recipe!